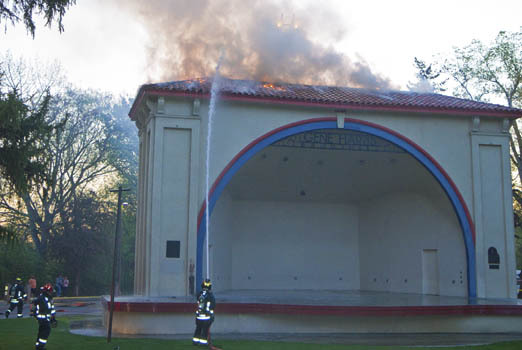 Boise firefighters battled a stubborn blaze Monday night at the 90 year old bandshell in Julia Davis Park. The bandshell was named in honor of the late jazz pianist Gene Harris a few years ago. The historic structure presented a challenge because they didn’t want to damage the structure as the flames began peeking out between the clay tile roofing of the historic structure. Normally they would fight the fire from inside, ripping holes in the walls and ceiling, but fear of structural weakness forced them to attack from outside. Cause of the fire was unknown, but it appeared to have started inside the backstage area in a corner. The flames went up the inside of the wall and into the rafters. Cause of fire – unknown. My guess: hobos or kids with matches. I remember when I was young, in the mid 80’s, there were frequent events at the bandshell. My mom would take us there and we would sit on a blanket in the park. I (roughly 3 or 4 years old), would roam around during the music and ‘introduce’ myself to all the other visitors. Mostly, everyone was friendly, we all had a good time, and I remember feeling safe, and enjoying every moment of it. Band shell saved: Music to my ears. Re LD’s comment about attending events at bandshell: why are there no music events like the weekly band concerts in Twin Falls? BB probably right. Not telling us the cause is suspicious. It must be a politically incorrect cause. How about we NOT spend $70 MILLION on a library and we spend enough on the band shell to make it “modern” yet original and make a really nice graded seating area in front of it. Beats the $1.5 MILLION we spent on goofy metal trees in front of city hall. I’d like to second Frank’s motion. The new “trees” in front of City Hall look ridiculous. Frank and Rebel.. you shoulda seen the big squares from the old days.